PHRs allow real-time access anywhere. Personal health records allow families, caregivers, and health care providers to access an individual’s history, emergency information and more. These tools help seniors take charge of their own health and help families better care for loved ones. 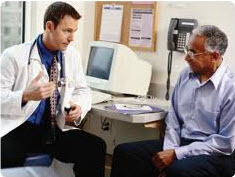 A personal health record (PHR), an electronic collection of medical information, makes a patient’s history accessible at any time from a Web-enabled device, such as a computer, tablet or smartphone. Separate from electronic health records or electronic medical records — which are owned by hospitals, doctors’ offices or health insurance plans — PHRs help family caregivers gather and manage their information in one easily accessible location. The benefits of having a PHR include quick access to vital information during an emergency, being better prepared to ask questions at a doctor visit, tools to track progress, and a means to organize appointments and screenings. It also allows family members to have real-time access to the latest care of a loved one, even if they live far away. Each individual decides which information to include in a PHR. According to the Mayo Clinic, the basics may include a primary care physician’s contact information, medications and dosages, allergies, chronic health problems, dates of major surgeries, and a living will or advance directives. Examples of preventive care that a patient may choose to add to his or her PHR include screening results, cholesterol levels, blood pressure, diet and exercise habits, and health goals. OnPulse is a service that allows users to communicate privately with providers, form care teams based on a diagnosis or condition, and track when information is viewed. OnPulse users also can communicate with loved ones online and access tips, lists of providers and other educational resources. Those who prioritize privacy and security might consider Minerva Health Manager. It lets users securely store their health records on their home computers rather than on the Internet, then access them from mobile phones and other devices via flash drive and viewer tools. The Minerva PHR Viewer works with iPhone, iPad and Android devices. Caregivers Touch is an option that lets users organize data, then store and access it via an iPhone application. Caregivers Touch users can set up individual profiles for sharing information. For example, a user might share a calendar of appointments with a nearby family member and a contact list with a friend who lives elsewhere. Contact our team of Product Specialists for personalized help with products and services for seniors and caregivers.